Giving Tuesday has really transformed the holidays for me. The day and movement was born out of the efforts of the 92nd Street Y in NYC along with some enterprising and socially conscious leaders who pioneered the idea in 2012 as a counter to the biggest shopping combo of the year, Black Friday and Cyber Monday. The first Tuesday after Thanksgiving is now one of the biggest charity days of the year. This year’s total exceeded $116 million donated and more than 1 million gifts. 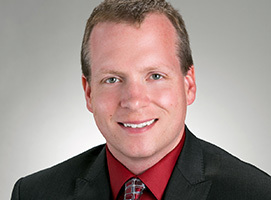 Giving day guru Justin Ware, who works with our ScaleFunder platform, offered some great tips on how to get your own giving day organized as well as excellent insights in his recent podcast interview. To add to this great advice, I’d like to break down what I saw as a donor and fundraising geek in the donations that I made on Tuesday. A central example of #GivingTuesday greatness is one of my alma maters, Illinois State University, where I used to work and now geek out as a doctoral student studying how and why people give to higher education. We partner for their phone program, but their giving day program is a creation of their energetic and creative advancement team. Here are the things that I saw that impressed me on Tuesday at Illinois State and other charities I gave to and why I think they worked. 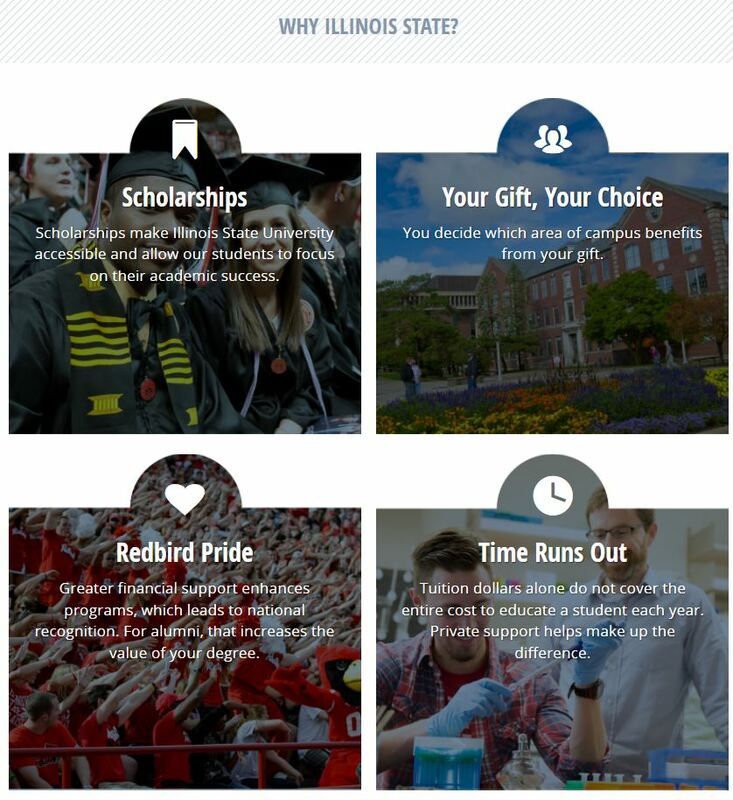 4 compelling reasons to give to Illinois State University, all on one screen. Giving Tuesday is a movement. We’re all getting solicitations. Everyone wakes up and quickly realizes “something is up.” But you absolutely cannot expect that the day or increased communication alone will motivate donors to act. We still must show why giving is important. This helps your donors sift through the requests and reminders they will get and focus on their passion, and also allows you to make several cases for support. Illinois State did this with four key messages which appealed to just about any donor. I like this strategy of offering several quick reasons, which should echo the messages sent earlier in the year in your other communications. If I liked the buildings, I was moved. If I wore red every Friday, I was moved. If I wanted choice (see below), I was intrigued. If I was a science geek (I am), I was moved. It’s important in the very quick, short time you have with donors on a giving day to get your message out powerfully and across all types of donors. Think diversity, pictures, and 3-4 key messages. Do many donors realize that these challenges are often the packaging of gifts by generous philanthropists that might otherwise still come? Probably. Donors are smart. But what challenges really do is emphasize donors, big and smaller, can work as a team. And where there is a team mentality, we all know, there is success. Do not underestimate the motivating value of a challenge to your donors. And remember, being the “challenger” is a powerful experience for the big donor as well. Illinois State’s day began with a challenge to reach 500 donors and receive a total of $109,000 in matches, which they met early in the day. 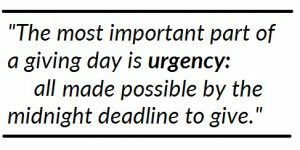 The most important part of a giving day is urgency: all made possible by the midnight deadline to give. I am a big fan of incremental and varied giving goals for a giving day. In just the same way that for a capital campaign we might begin with silent large donors and complete with a big participation push, there can be phases to the goals on giving days that can be met over the course of the day. This requires significant planning, and probably devising some goals you might not ever get to based on the response. The best giving days design reachable and “stretch” goals that are unveiled over the course of the day. For the second year, Illinois State had several goals throughout the day. 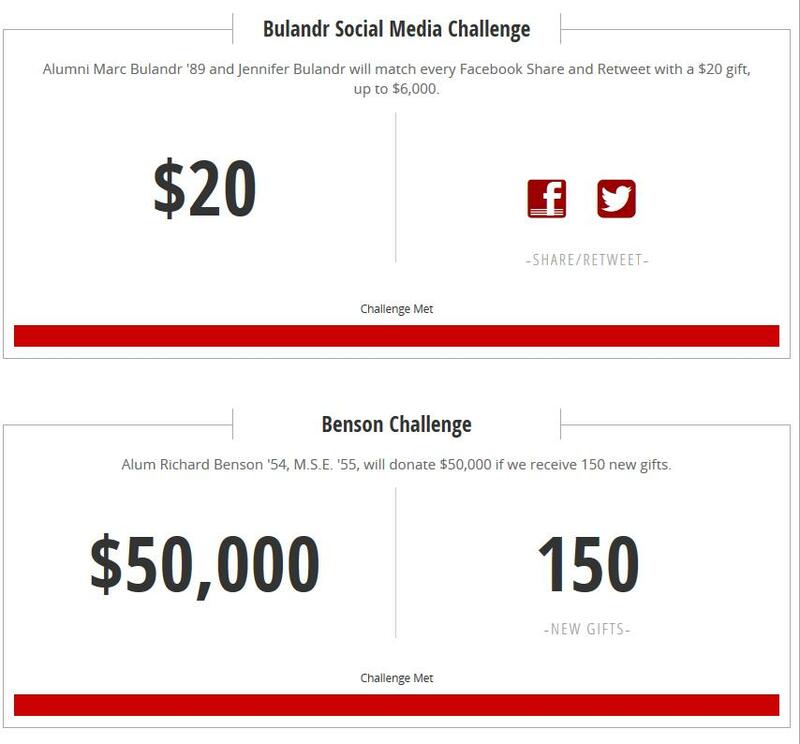 It began with that 500-donor challenge and then progressed to the next challenge for new donors, a social media challenge ($20 a Tweet!) and a challenge to break the record. As I said to Lora Wey, the executive director of annual giving at Illinois State, this is pure genius. Incremental challenges on a giving day accomplish two important things. First, they give your organization measurable and attainable goals that you can meet over the course of the day. You are set up for success and the success build while donors participate and watch. The second reason for incremental challenges is more fundamental: all human behavioral change is incremental. Too often, we ask for giant leaps by donors or groups of donors, and we’re disappointed as fundraisers when they don’t do as we hoped. I think donors are just as often disappointed with us that we thought they were ready to jump over a canyon when we’re still in the stage of clearing puddles. When we treat donors like real human beings and take them on a journey, we all become extraordinary together. Giving day success hinges on ambassadors. These are people who are willing to both take action to personally give and then announce it and chearlead on social media during the giving day. It’s important to work with these ambassadors weeks and months ahead of time and provide specific suggestions and expectations including timelines for specific social media activities on the giving day. Volunteers need direction, and they’ll also offer feedback during and after the event which you can listen to and improve the event for future years. Indeed, many of the gifts “on Giving Tuesday” are pre-agreed to by volunteers. This helps build an initial momentum and gets the ball rolling at the start of the day. It’s come to be what both donors and volunteers expect. Several organizations I gave to on Giving Tuesday offered Twitter and Facebook images after I made my gift that I could use to help publicize the effort, and every organization completed the giving process with a “share” option so I could announce my gift. This is a best practice. In addition, creating a special hash tag (such as #GivingTuesdayISU, #GivingTuesdayMYORG) helps bring donors into your special campaign. We’re posting annual records for total funds raised in many charitable sectors, The Great Wealth Transfer is fueling massive major and planned gifts, and we have a living philanthropist dropping billions to good causes in the Giving Challenge. It is in many respects the age of big philanthropic money, and donor participation might fall by the wayside in the shadow of these massive checks. This is where giving days really shine. They’re incredibly democratic. With the combination of major donor challenges, social media energy, and live feedback to donors through great technology, there’s a real opportunity to talk about both a big total for the day and a whole lot of people jumping on board. This emphasizes the power of group action, builds donor confidence that what they are investing in has social support, and builds your donor pipeline for the future. I strongly recommend that you emphasize both donors and dollars in your giving day goals. The best giving days (with the biggest dollar totals), such as those at Purdue and Columbia, have done that to great success. All my Giving Tuesday gifts were very quick, with donation forms that took no more than two clicks and asked nothing more from me that was absolutely necessary to process the gift. On a day when someone who has the “giving bug” will make multiple gifts, you want the process to be friction free. A study last year told us that on average, giving pages take 7 percent longer to complete than commercial purchases and we need to really work on this. Make your giving day as easy as possible to participate in, even if that means a little extra work on your part to process the gifts. The 92nd St. Y continues to operate a powerful and friction-free Giving Tuesday program. How donors get to your giving page is also very important. The best example I saw of this was the 92nd Street Y, founder of Giving Tuesday, who simply greeted me with a splash page right when I typed in their URL. I’ve never been there, don’t live in New York, but it was important on this special day for me to drop a contribution to the place that started it all. And they made it very easy. The total donation process was less than one minute. Allowing donors to give to their passions is also crucial. Illinois State steered donors to the main giving priorities while allowing them give to any fund at the university. I think this is a winning move. The majority of givers will go with what you pre-populate in your menus, but you definitely don’t want a donor to stop on your giving page if they can’t find exactly what they want to give to. I know this is a controversial statement, when all organizations need to maximize unrestricted funds. But consider that the donations a giving day are likely to elicit might also be thought of as “votes.” Allowing donors to organically visit your portal, and send in a gift to open designations really does allow you to see what they care about. This is actionable information about donor passion you can use as you move forward to seek increased giving. With open giving designations, giving days might actually become a form of prospect research for many organizations. 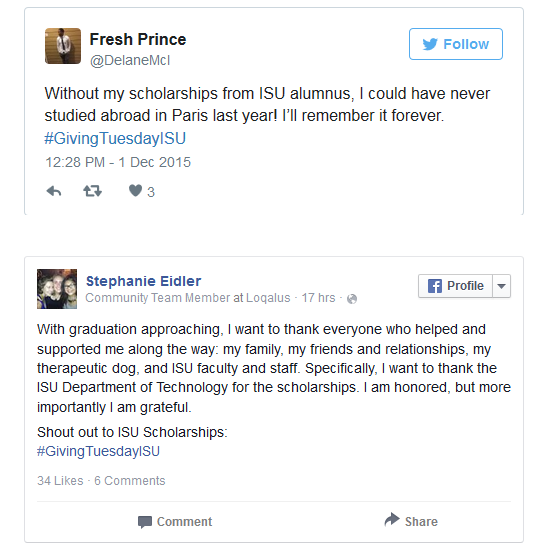 Tweets from grateful Illinois State University students. There has in fact been a growing #ThankYouWednesday movement suggesting that after the commercial Thanksgiving weekend and Giving Tuesday, we focus on stewardship. I say, why wait? Illinois State certainly didn’t. Giving Tuesday on campus included recording of video thank you messages from students and a giant thank you card for donors. Along with that, there were some truly incredible and moving social media posts. Check out the best Tweets and photos at Illinois State from their collection put together on Wednesday. When your giving day is done, it’s important to put together a great package to announce the results to those who contributed. You also need to get general press out about the total results—this will build the case for involvement in future years and increase confidence in your organization. That’s right—a successful giving day might just attract donors who didn’t give on Giving Tuesday. That’s right, 1,445 donors and $556,733 in gifts. That’s one giant #GivingTuesday and an institutional record. Congratulations, Illinois State, and thank you, fellow loyal Redbirds. Let’s make it even bigger next year. And congratulations to the philanthropic community—donors and fundraisers. We’ve likely set another #GivingTuesday record. If you’re ready to break records with your next giving day, drop us an email. We can show you how the combination of great technology, a compelling message and multi-channel donor outreach can help make it happen. I also invite you to attend Justin Ware’s webinar, coming in January, Going Digital for Major Gifts, which will also touch on cultivating major donors during giving days.